The strength and relevance of CURC is at the local level and that’s where we must build the organization, according to the president of one of our most active area councils. “If CURC is to grow and have relevance, we need strong area councils,” said Malcolm Buchanan, president of CURC’s Hamilton-Burlington-Oakville Area Council. Buchanan was making a presentation at CURC’s 10th Constitutional Convention to explain how other area councils could duplicate the success of the Hamilton-area group. 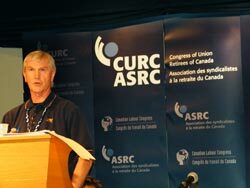 CURC’s mission, as outlined in our Constitution, is to support the Canadian Labour Congress, provincial federations of labour, local labour councils and other union organizations, he pointed out. We do this by petitioning various legislators, by lobbying, by promoting retirees’ rights and by educating our members and the public. The first step in building local strength is to encourage all CURC affiliates to attend meetings of their local area council, he said. And that is best done by getting as many members involved as possible in developing CURC campaigns. When the Hamilton council was lobbying local MPs for better pension protection, Buchanan said, the Hamilton council “brought all of the groups together and decided on what we were going to present. We spoke on behalf of all of the members of CURC. Doing it by yourself is fine, but when you speak for all of the [affected] groups, your message has more strength. One of the Hamilton council’s priorities is to spread the message by helping unions organize their own retiree groups, he said. The Hamilton council also makes sure that there is a purpose when it holds a meeting, he said. “There’s no point having a meeting if you’re not conducting business. You must be focused. Another key is to respect everyone at meetings with respect and dignity.